You've probably seen embossing on greeting cards and wedding invitations. Postcard embossing has been around since the turn of the 20th century, when people would paste their own images onto generic embossed cards and send them to friends. Embossing uses heat and a pair of etched metal dies to raise a design above the surface of a sheet of paper. The bas relief (or male) die pushes the image up, while the mold-shaped (or female) die presses on the paper from above. The result is a raised, embossed image on one side, and an indented, or debossed, image on the other. Embossing gives postcards an appealing dimensional effect, both tactile and visual. It can be used for letters, logos, graphics, borders or other design elements that you want to stand out. Because they have a raised pattern that's visible from both front and back, embossed postcards create some special design considerations. Choose a cardstock and an image that are well-suited to embossing - and to each other. Certain card stocks produce better embossing than others, so consult with your printing company. The same is true of images. An image with a lot of fine detail may not be a good candidate for embossing. The type of stock you use will affect how the embossing looks. Softer, thicker card stocks will produce greater detail in the embossing while others will create a deeper image. Embossing is more visible on paper stocks with a lower brightness. Don't plan any embossing in the areas where the address and postage will be. Addresses must be easy to read. Avoid printed text in the embossed areas. Remember that embossed text will appear backward on the postcard's reverse side. When embossing is used alone it is known as blind embossing. It can also be paired with ink or colored metal foil (using a combination embossing and foil stamping die) to make the embossed design really "pop." As an alternative to a raised image, some design elements might work best as an indented image, which is known as debossing. In this case the male and female dies are reversed. 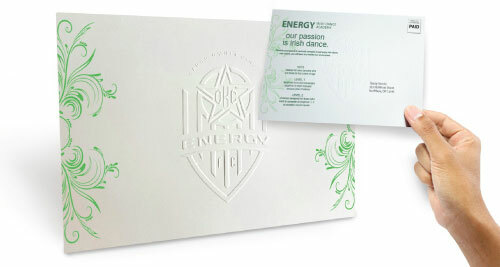 An embossed postcard is a great way to attract attention to a product, service or event. When paired with colored inks or foil stamping, embossing opens up a whole range of design possibilities - from understated and traditional to colorful and edgy. Embossing can help you convey a particular message, promote your brand, and encourage people to act. Embossing makes an invitation to a sale, seminar or event feel special. Embossed invitations are common for special occasions like weddings and galas. By embossing your postcards, you suggest that your event is special as well. Embossing suggests that something is official, certified or guaranteed. Blind embossing is used for official government seals, and we've all heard of a "seal of approval." Embossing on a postcard can imply quality and credibility. Embossing is a good way to promote upscale products and services. An embossed postcard feels (and is) more expensive than a standard one, and it sends a strong message about the luxury qualities of a product or service. Embossing gives postcards a texture that stands out. With its raised design, an embossed postcard feels different than a plain one. An embossed postcard instantly stands out from the rest of the mail, increasing the chance that the recipient will read the card and act on it. Embossing can turn a postcard from ordinary to exceptional. 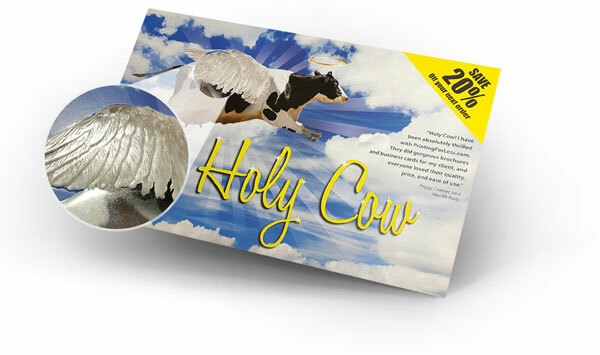 We carry a wide range of custom stocks, ink colors and foils to give your embossed postcards a unique, custom look. Need technical or creative advice on your embossed postcard project?